In Volume 31, Williams (Swansea) surveys the deamination of carbohydrate amines and related compounds, updating earlier discussions by Peat (Vol. 2), Shafizadeh (Vol. 3), and Defaye (Vol. 25). Gelpi and Cadenas (Buenos Aires) provide a comprehensive treatment of the reaction of ammonia with acyl esters of carbohydrates; their article greatly extends that by Deulofeu (Vol. 4). A chapter by Watson (Jackson, Miss.) and Orenstein (Boston, Mass.) brings the article by Hudson (Vol. 4) on the chemistry and biochemistry of apiose up to date. Lindberg, Lonngren, and Svensson (Stockholm) discuss the specific, chemical degradation of polysaccharides in an article that updates that by Bouveng and Lindberg (Vol. 15) and complements that by Marshall on their enzymic degradation (Vol. 30). The extensive literature on the chemistry and interactions of seed galactomannans is surveyed by Dea and Morrison (Shambrook, England), thus adding to previous articles on the chemistry of a variety of polysaccharides. Glaudemans (Bethesda, Md.) provides an interesting discussion on the interaction of homogeneous, murine myeloma immunoglobulins with polysaccharide antigens, and also describes the career of the late H. G. Fletcher, Jr. 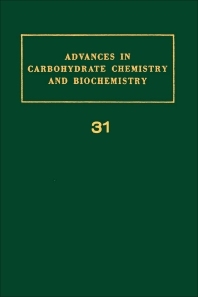 In a continuation of our series of bibliographic articles on carbohydrate structures that have been ascertained by crystallographic methods, Jeffrey (Pittsburgh) and Sundaralingam (Madison, Wis.) treat those structures definitively established in 1973, and list all of those determined satisfactorily before 1970.